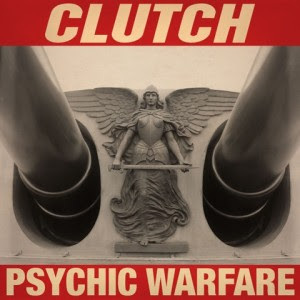 Here’s the scoop – Clutch release greatest hits album called 'Psychic Warfare'. Here’s the catch – it doesn’t contain any of their greatest hits, but trust me it will. Ultra consistent Clutch have followed 2013’s widely acclaimed 'Earthrocker' with their eleventh studio release that may well be their best work yet. Superbly produced by Machine, a long-time collaborator, the record sounds just terrific with the bass of Dan Maines riding higher up in the mix, Tim Sult’s guitars as hard and precise as diamond, JP’s drumming propulsive and crisp, and Neil Fallon’s voice sounding even better than ever. The album draws on their back catalogue in the sense that it contains echoes of previous, favourite tunes, but this is an incredibly strong set of new songs with lyrics that are provocative and really reward deeper listening, with their customary cast of weirdos, lowlife operators, mystics, misfits and patriots. If you don’t crack a smile by 8 bars into opener and first single 'X-Ray Visions' then you’ve definitely overdone the Botox. Clutch’s distinctive heavy groove, with riffs aplenty and a funky backbone, doesn’t let up until musical interlude 'Doom Saloon' at track 7 followed by the one reflective song 'Our Lady Of Electric Light', on which Fallon does a very passable impression of the late Johnny Cash. By then we’ve already taken a seat of the pants ride, with unrelenting songs like 'A Quick Death In Texas' and 'Sucker For A Witch', through the less glamorous alleys of unknown America. After taking breath, the pace picks up again to penultimate track 'Decapitation Blues', and we do indeed feel like we’ve been ‘kicked in the neck by a 3-legged mule’. 'Psychic Warfare' closes out at around the 40 minute mark, perfect length for an album, with the coup de grace that is 'Son Of Virginia', an anthem with choral touches and a rock solid core. It certainly convinces that ‘truly we are living in an age of wonder’ or should that be shock and awe? Clutch are an amazingly hard-working band, their live shows are, in my experience at least, never less than incendiary. Their back catalogue is liberally sprinkled with great songs and yet they continue to defy the odds by just getting better and better. 'Psychic Warfare' is a superb piece of work by any standards and listening to it makes me proud to consider myself a Clutch fan. Life would be much the poorer without their idiosyncratic world view and their powerful music.